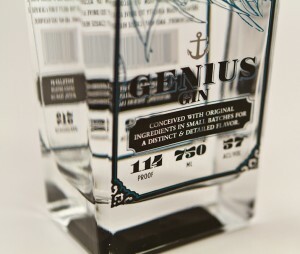 Genius Navy is bottled at 57% abv -114 proof-; the historical proof carried o n British Royal Navy fleets. Due to its low water content, this was an ideal proof for voyages since it could be safely spilled on the ship’s gunpowder without rendering it unusable. Genius Navy intensifies the botanical brightness and depth of Genius Gin while also making cocktails more flavorful. The finish is superbly clean and textured, providing a mouthfeel more similar to bourbons than a gin. Genius Navy is perfectly sippable-especially for whiskey and cognac drinkers- but also has the versatility to balance your favorite Gin cocktails. If you seek intensity and bold flavors, you will soon find yourself reaching for Genius Navy every time. Available in 750ml.